Wolfshead Bowmen Michelham Division is based at the 13 th century site of Micheham Priory near Hailsham in East Sussex, where we shoot the longbow every Sunday starting at 12.00 noon. 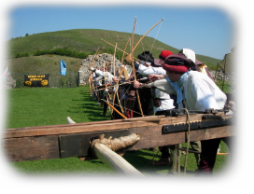 Anyone interested in historical representation of medieval archery is welcome to join the Michelham Division. This is an informal group, and if you have never shot before, tuition using club equipment can be arranged. For further information contact our Secretary. Full membership of the Wolfshead Bowmen Events Group is by invitation only, after attending a minimum of three events as a guest member. Families are welcome and for those who do not shoot, an instruction course can be arranged. An adult must accompany children under 18. If you are interested in Medieval history and are interested in joining the Events Group, please contact our Secretary for further details.